Dividing plants is a fairly easy process. You can divide pretty much any kind of hearty clumping perennial (where one plant is actually a whole bunch of little plants in a clump)–irises, day lilies, and ornamental grasses are great candidates. The process is simple–you dig the plant out of the ground (with a pretty good size root ball), then with your garden spade, cut that baby in half straight down the middle. And just like that–you have two plants! You can also divide into several plants at once, as long as each new plant has roots to grow from. Perennials actually benefit greatly from dividing every couple of years. Otherwise, the roots just get too packed together in the middle, and they don’t grow as well. Then you end up with a plant that looks great on the outside edges, but the middle is brown and shriveled. Not pretty. I decided to apply this same concept to my chives. I dug straight down through the middle of the plant, and removed half of it. Then I split that into smaller plants, and plopped each one into a pot. The oregano was a little tougher to work with, since it has one woody root system (as opposed to a bunch of smaller ones), but I mashed the spade in there, then jumped on it a few times until it broke through. I know this sounds a bit barbaric and like I am being a little rough on poor little Mr. Oregano, but I am pretty sure nothing can kill this guy. Hopefully the transplants survive! I will keep you posted. And please, if you are in town, message me and come get some herbs! I have a mint plant that I keep finding all over my herb garden in the middle of parsley and lemon balm and what ever else it can find. I put up with it because it taste so good. actually mojitos are the reason we first planted the mint. Yup, me too–love the mojitos! But I learned the hard way–mint needs its boundaries. The wine barrels work pretty well, but it still comes up all around them. I would like to have some oregano! I was growing oregano in containers in my sunroom and for some unknown reason, it all kicked the bucket. I have used herbs as a part of my formal landscape (ok, it’s not so formal). I love the chives because it gives a small grass look and it’s soooo convenient. Rosemary is a good looking plant too. I live in the northeast so sometimes it dies out over winter but sometimes it doesn’t and it’s a really nice big bush the following year. Too bad I can’t grow limes for the margaritas. Great post. 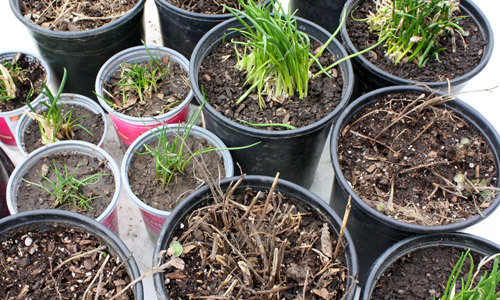 Love chives….need to divide mine up.